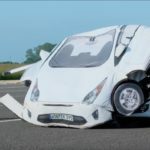 Yesterday, Nissan unveiled a bold new concept car fulfilling the “zero emissions zero fatalities” promise made a couple years ago. 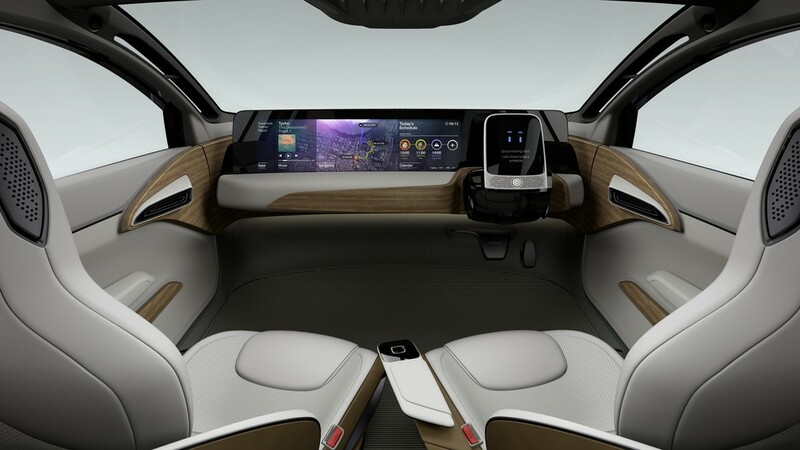 It’s an all-electric car with self driving autonomous features galore. Its story is told with an enticing image gallery and a series of video’s demonstrating usage scenarios that aren’t quite the challenges faced by regular folk — how many of us are big name performers who can spend a lazy day driving the countryside with their girlfriend before heading into town to perform a concert? That aside, Nissan is offering us a glimpse into a possible future. I’ve published the full press release and videos of the IDS Concept car, and a complete picture gallery. Before we get too far into this, I urge you to watch the movie Brazil . It’s a 1980’s movie showing a future full of autonomous gadgets that repeatedly do the wrong thing. 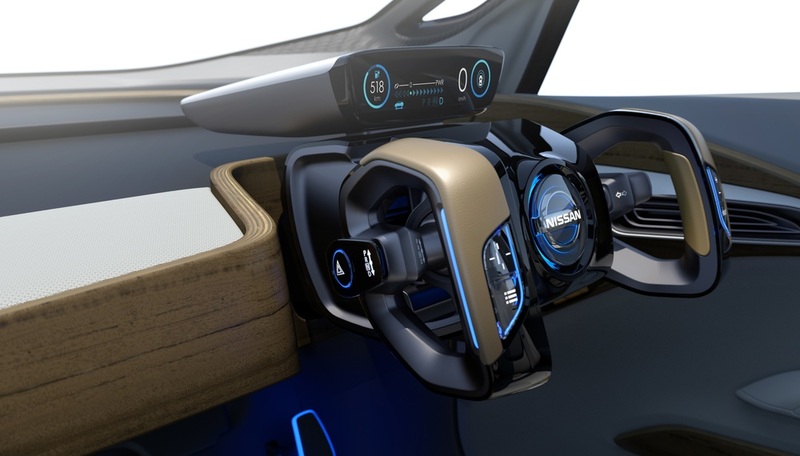 In Nissan’s videos about this concept car, they show other autonomous gizmos such as a breakfast maker machine automatically making coffee and toast. In Brazil, the breakfast maker hilariously failed at that task. The future may not turn out as perfectly harmonious as Nissan’s portrayal. As a software engineer with years of experience in software quality engineering, I know this: All software has bugs and fails to live up to the hype. Nissan’s vision requires a ton of software to work correctly. In other words, what’s shown here is a preview of technology expected to be rolled out to the market by 2020. 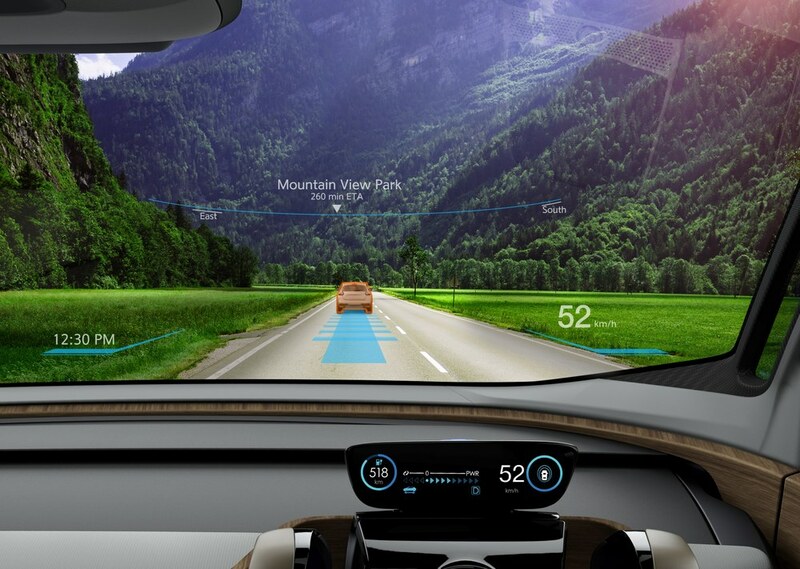 Nissan envisions two driving modes – Piloted Driving, where the car is doing everything, and the passengers can turn to each other for a conversation – Manual Drive mode, or what we’re accustomed to today, with the driver operating the car but Nissan envisions this being augmented by heads-up display information overlaying driving cues on the front window. For example, one segment in the videos shows driving amongst some motorcyclists, and boxes are drawn around the motorcyclists as if to help the driver identify objects to avoid. This is the Manual Driving Mode steering device. Rather than a Steering Wheel, this is more like the control doohickey used in airplanes. In Piloted Driving mode the steering yoke rotates away, and the whole car undergoes a transformation. The effect is like those Japanese robot movies (Transformers). In this case the computerized information display shown here rotates up so the passengers have a huge touch panel display to interact with, and the steering yoke rotates out of sight to be replaced with …. Uh… this is essentially a giant iPod, right? Except it has animated blinking eyes presumably to make the hunk of electronics appear to be friendlier. 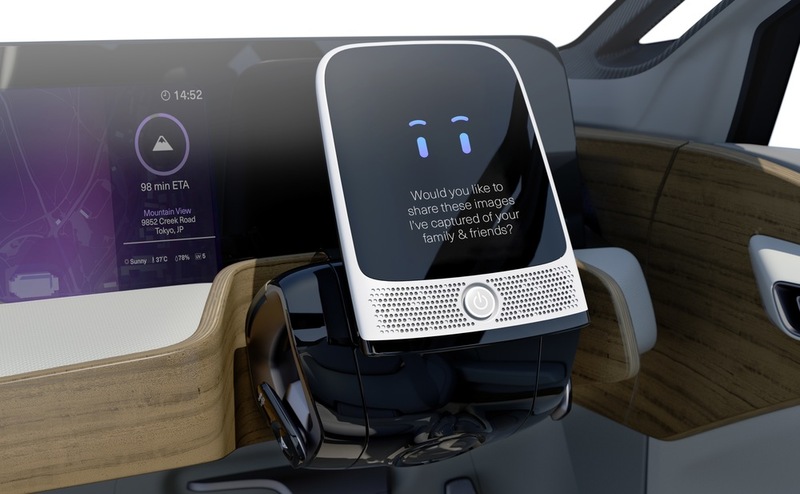 The videos show an extensive infotainment system that’s all the touch-based goodness of interacting with iPhone/iPod/iPad but on a screen the width of the front of the car. Several applications are shown running side by side, some of which are entertainment oriented, others show information about the trip and driving conditions. 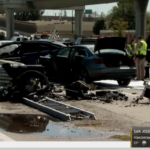 Question: What is to happen when an unexpected emergency arises? Your car is propelling you at 80 miles/hr down the road, and something goes wrong. You have no steering control available because it’s been transformer-ized out of existence. The car is encouraging you to have conversation with the passengers or to do something else like read a book or take a nap or to do something with your girlfriend that will completely dominate your attention. How will you be able to react quickly enough to save your life within the 10 seconds or less necessary to avoid catastrophe? 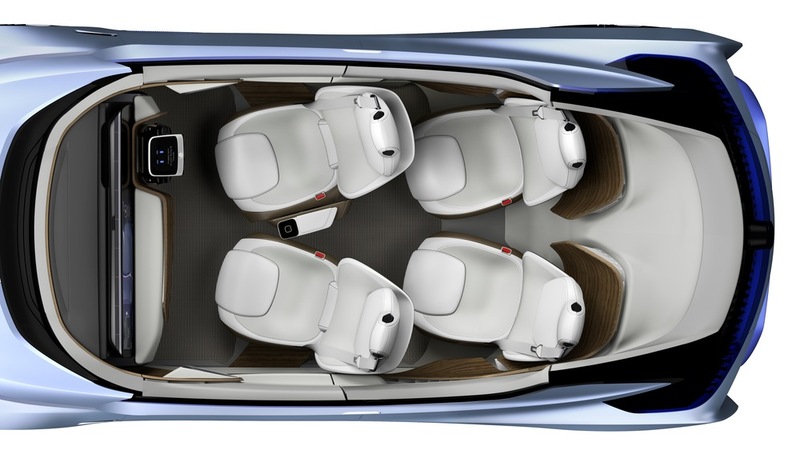 To encourage conversation between passengers, Nissan envisions that in Piloted Driving mode the chairs will swivel towards each other. 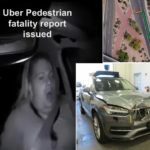 The videos also shows accelerator and brake pedals moving out of the way. All this means the car will be taking care of everything — but the car could fail to do so, and then what? 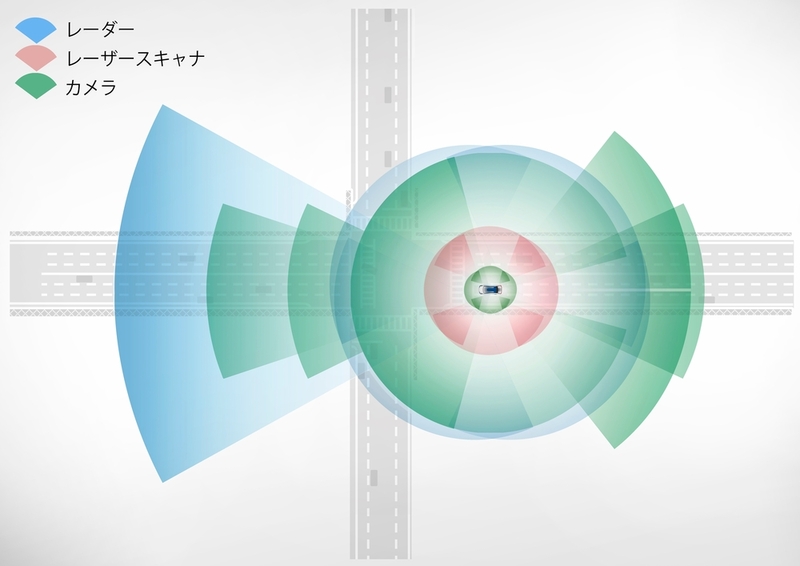 To implement Nissan’s vision, the car will have a full array of sensors – cameras with vision analysis, RADAR, SONAR and more are commonly used. These sensors are coupled with on-board computers that have to be programmed to understand driving conditions around the car, and to take appropriate actions. 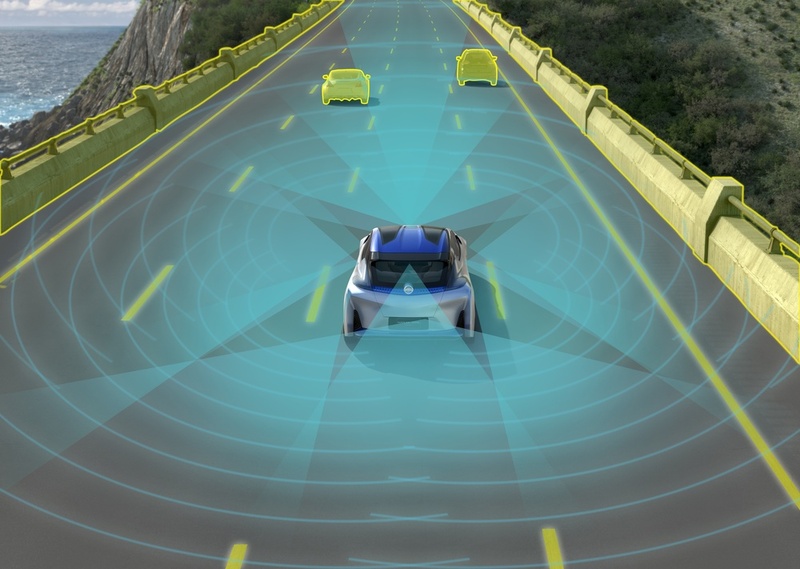 Nissan talks about extensive use of artificial intelligence capabilities to guide the automated driving experience. What I see is millions and millions of lines of software that’s probably extremely buggy, and a huge potential failure to live up to the hype we’re being shown. This is an example of the heads-up information overlays presented on the wind-shield. This has the potential to be very useful as an aid to piloting the car. For example this picture demonstrates to the driver the safe following distance to the car in front of them. That’s a wonderful piece of additional data. Currently drivers are guessing the safe following distance, and often failing to guess correctly, leading to the constant string of rear-end collisions. Additionally many drivers have limited depth of field, for example a cataract may limit eyesight, and they cannot adequately judge the safe following distance. An information overlay like this would help a lot. Nissan’s video’s also portray the potential benefit of wireless charging. A self driving car could drive itself into a parking lot and automatically find a parking space. With wireless charging, the car could then automatically start a charging session without requiring the person to plug the car in, and without requiring one of those robotic snake things Tesla Motors demonstrated. 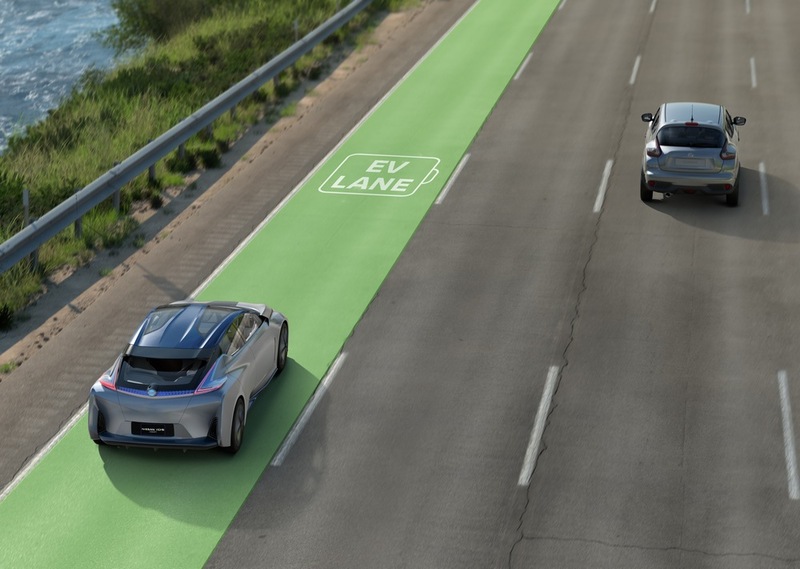 In this picture they’re showing a lane on the highway which automatically charges electric cars as they drive. Implementation of either requires an ubiquitous presence of wire transmission loops embedded in roads or parking lots, and matching receiver loops in the cars. It’s easy to envision something like this, and plenty have done so. But, who will pay for it? This requires rebuilding the majority of parking lot spaces and highways with wireless charging loops, which obviously will cost lots and lots of money, with little potential for business reward. Watch the movie Brazil. 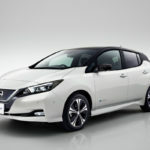 Is it a better predictor of the future than Nissan? Brazil is a dystopian look at a pseudo-future. It features heavy-handed government security agencies that are terrorizing the populace, and a curiously strange technology system that fails to live up to the promise. 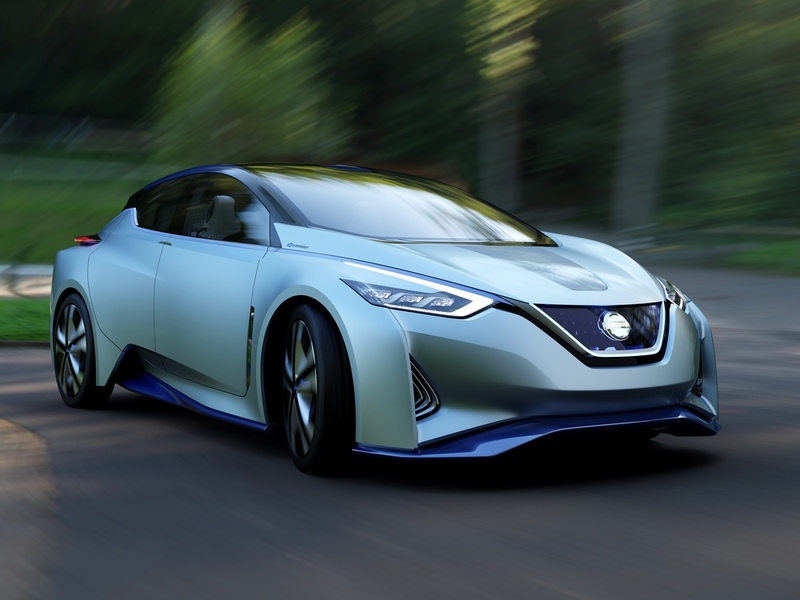 Autonomous Vehicles, Concept Car, Nissan, Robocars, Self-Driving cars. Bookmark.